Beatrice stopped under a shade oak and leaned over the stroller to shine an upside-down smile at Clarence. Her baby’s eyes brightened when they lit upon his mother’s face, but his head thrashed as if his body struggled against his will. Bea hated that voice. It didn’t implode her amygdala like BestBaby’s ‘Distressed’ intonation, but every time Clay spoke in ‘Frustratese’ — which seemed far too often — she felt she was subopting as a mother. Clay strained against the straps, against himself, his fists rubbing hard at the sides of his head. Bea crouched to face him. She gave Clay her finger and he took it. His eyes, looking pained under a knitted forehead, touched hers before moving away. What suffering could crease so many wrinkles upon so tiny a brow, Bea wondered. She wished her baby could tell her what was wrong. Wished he could communicate beyond the most basic grunts and wails and fMRI monitor trigger-words. Maybe she should have pressed Dr. Lee to look deeper during Clay’s six-month PotCap. Nevertheless, the examination was thorough, she told herself. And the last thing Clay needed was a psych flag on his assessment. Bad enough he had to endure the extra neuroplastic work beefing up his Sub-Optimals in visual memory and lateral cognition — not that Bea complained. She thanked every one of her lucky stars that they could afford it. Still, a psych flag could double the time Clay had to spend at Population Assessment. Worse, even the hint of a Psychological could close a lot of doors, doors that wouldn’t reopen, no matter how high they managed to get his Potential Capability scores. How he hated the exams … the hypos, the VO2 mask and all the fine motor work. It was little wonder they made parents turn off their monitors. Even now the thought of silencing those Distressed “Mommy” calls made Bea feel like she’d swallowed all the mercury in Dr. Lee’s collection of vintage medical equipment. Rocking him, patting his bum, Bea sat against the oak’s trunk and began to sing. Her cheek to his, she felt a deep sigh heave his tiny body. “Mommy,” the BestBaby said, Content at last. She was lucky, she told herself. A lot of women didn’t have the means or the opportunity to hold a child of their own. Bea continued singing. Finally Clay’s breathing settled into a deep rhythm. Sleepy clouds of Zs drifted across the stroller display. A flashing broke through the snooze-clouds, a bright and cheery notification. The Ellis’s baby, Barbara, was already reading at a two-year-old level and had been pre-admitted to Westshore Primary. Beneath the oak’s hanging branches, Beatrice hugged Clarence to her breast and began to cry. Craig Temple writes from Gastown, the Victorian-era old quarter of a much younger Vancouver, Canada. By day, he makes his living writing imaginative grant proposals for the technology world. By night, he is most often found inside his own head, imagining what, in our technological world, we take for granted. His work has previously appeared on CBC Canada Writes. 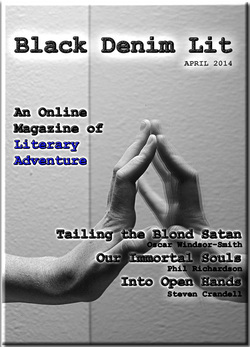 The BDLit Stories by Craig Temple: “Best Baby” - Issue #3, Apr, 2014. He can be found on the Web, Goodreads and Twitter.